This is one of the many things that I came to realize upon reflection over this Christmas Break. Call it a bit nerdy, thinking about my trailer loan, but there you have it. 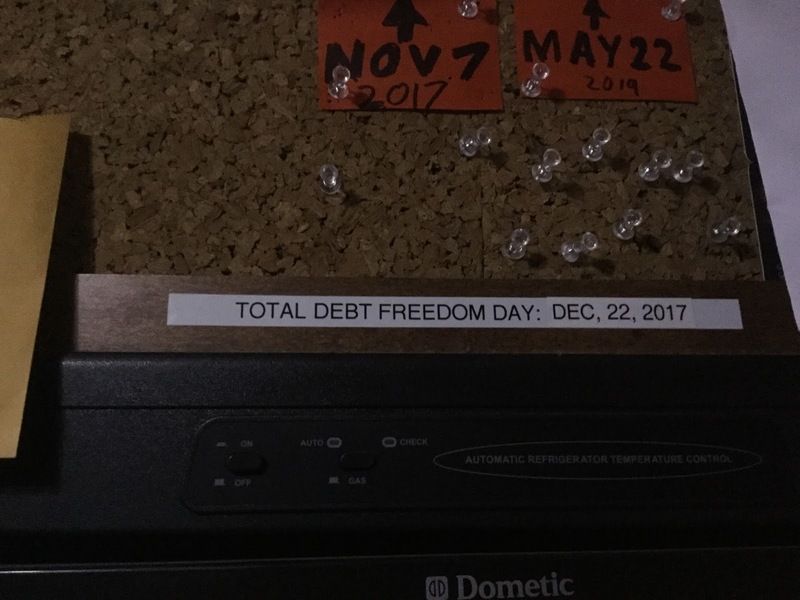 Now that the New Year has begun, I now can focus on paying off the Wanda debt, my last and by far the largest loan debt I have ever had. Sure the payments are only 122.38 Bi-Weekly, but the overall, original outstanding balance was over 36,000.00, it now stands just over $34,000. This loan was structured like a mortgage and so it is to be renewed every 5 years but meant to be stretched out over 20+ years. So, me paying this thing off this before its first renewal date is big. 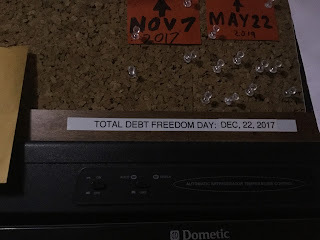 I ran the numbers and it doesn’t look good for me to make my previously stated total Debt Freedom Day of: November 7, 2017. With that in mind I have pushed it back to the last payday of this year: December, 22, 2017. So, here is the new and updated debt countdown . . . 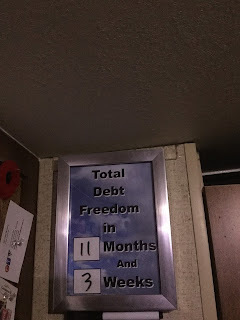 The key thing to note is that I will still be debt free, and it will still happen this year. I will have a better picture of exactly when that will happen, once this month is over. You see, I am measuring what is happening to the Wanda Debt with each payment, and is the first month of me making regular extra payments. I will be able to see just what impact each of these payments are actually making on that loan. With that I should be able to make some predictions on the loan going forward. The other upside of me pushing this date back is that if I pay the loan off early, great! If I have to take up to the new date (December 22, 2017) then that is okay too. I know that this will impact my savings plan (for the property), which comes next, but that is contingent on paying this loan off. So the earlier I can do that, the better. The key thing to stress is paying it off: 1) at all, and 2) ASAP! I just have to be realistic, and that is one thing that I keep in mind these days, that is to be Optimistic, yet realistic. As always: Keep your head up your attitude positive, and keep moving forward.